The window switching thing bugs the proverbials out of me too. The magic combination for switching windows within an app is Command-Tilde. F10 will show you all open windows of an app. Or you can click and hold on the dock icon. Command+Home will move the cursor to the beginning of a document, email, whatever. Command+End will move the cursor to the end. I, too, find the fact that Home, End, Page Up and Down merely move the viewport around and not the cursor. You are lucky that the keyboard you use actually has those keys, though. New iMacs are sold with the tiny keyboards that don’t have the numeric pad nor the Home, et al keys. They also don’t have a backspace key so it’s Delete and Function+Delete. Hmm, I just tried Command+Home and Command+End in Pages, but it didn’t work. Command+Up Arrow and Command+Down Arrow did though. I feel like Conley…Option+Up/Down Arrow seems to move 1 paragraph or page at a time. Thanks Lex. Yeah we had one of those tiny keyboards, but after complaints decided to get one with the numeric pad etc. I’m still not used to the feel of the keypresses though. >> I’ve got used to having to go to the menu to properly shut a program. I’m not really clear on why clicking the red dot on the window doesn’t do it. 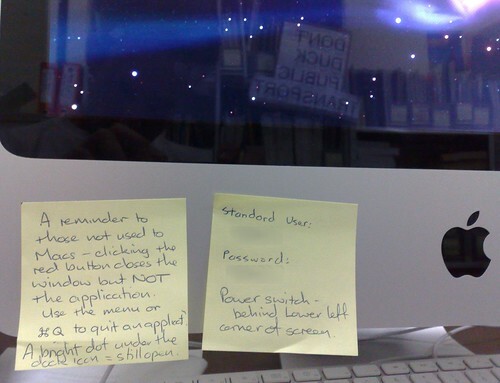 But that’s okay — another PostIt note reminds us Windows people of that. The close button on a particular document or window closes that particular document or window. So if you’re looking at a Word document then clicking the close button on that Word document closes that Word document, or if you’re in a Keynote presentation then clicking the close button on that Keynote presentation closes that Keynote presentation. The Macintosh platform has always been built from the ground up as a document centric environment, you are intentionally not meant to be worrying about applications. Windows on the other hand is a mixed bag – it is built from the ground up as an application centric environment, but both the operating system and software have changed over time to be a mixed bag of application centric and application centric trying to emulate document centric but failing miserably. Case in point, prior to Office XP both Word and Excel were MDI applications – a single APPLICATION window with true document windows embedded within it. Per the entire design of Windows, closing the Word window actually terminated Word itself and all the documents within it. No worries, except that most users could never grasp the concept of windows within windows (and is a fatally flawed approach when it comes to multitasking between more than one of each type of document – imagine working with three Word documents and two Excel spreadsheets, and thus having to resize Word and Excel to be usable on the screen and then the multiple documents within each of those windows… impossible way to work). So Microsoft took the Mac approach and changed Office to try and emulate a document centric environment – each window now allegedly a document, but of course Windows and Office were never designed to work that way so instead each document is actually an entire application window (eg menubar, toolbar, etc). You still only have one copy of Word in memory, but you see multiple entire APPLICATION windows pretending to be documents. Now since this still really is an APPLICATION window, not a document window, when you click the close button on an application window Word will intentionally not terminate but close that document. But wait, just to be inconsistent, terminating Word on the LAST document (err application pretending to be document) window WILL actually terminate Word. But wait again, if you clicked the old MDI close button (that amazingly is still actually there even though Word and Excel are pretending to be separate documents and not MDI) or selected Close from the File menu then the LAST document does NOT terminate Word – it’ll leave you with a blank window. Talk about a mixed bag, so are they documents or applications and are we choosing to close documents or closing applications… seems Office for Windows can’t make up its mind here, and in fact provides three buttons all of which react differently but called the same thing. But let’s get even further confusing again – for Excel let’s only have the one APPLICATION window that pretends it is a document window, and recycle that same application window for each document – eg if you open a second Excel spreadsheet then it goes over the top of the first, switch to the first and it goes over the top of the second, and so forth… the one application window is used for any and all spreadsheets. So now once again start closing the windows, and sure enough the same inconsistencies occur – depending on which “close” you are clicking you’ll either end up terminating Excel or end up with a blank spreadsheet. And the benefit of such a stupid approach introduced in Office XP and continued right through to even Office 2010 beta – you can no longer have multiple spreadsheets open side by side. Yes that’s right folks, open good old Excel 95 and you can drag and drop between multiple spreadsheets on the screen at the same time – but state of the art Excel 2007 is completely incapable of this. Worth mentioning that the “true document centric” Excel: Mac has no such flaw, I’ve in fact got several spreadsheets open in the background right now. Behind the scenes things can get a hell of a lot worse – for the most part the majority of Windows applications pretending to have multiple document windows actually fire up multiple instances to work on multiple things at once. So if you want to work on say 5 text files you actually run five entire copies of Notepad, or if you want to VNC to 5 servers you physically fire up and run 5 copies of VNC. Compare that to the Mac where you would have a single copy of TextEdit open but not care about the application itself but instead work on 5 document windows, or likewise have VNC open but again not care about the application itself but instead work with the 5 server windows you have open. Open more documents, close documents, create new documents… you’re just doing your job. Terminating applications, applications terminating themselves and needing firing back up, firing up multiple copies of the same application so that multiple tasks can be done, applications pretending to be documents, etc.etc… that’s a Windows way of life. Overall for the typical user this all makes little difference – they generally work “full screen” doing one lame task at a time, whether it be a user working on a Word document or even a Helpdesk guy VNCing to a single server at a time. But get a user working on multiple documents amongst other tasks or a network administrator controlling multiple servers at the same time amongst plenty of other admin tasks, then simple things like an application terminating just because you closed a document is highly impractical and if anything quite a waste of time. For instance one of my helpdesk guys might have a spreadsheet open (fullscreen) and a single VNC session open (again fullscreen) and will swap between those two windows to carry out a task and log the details, and moving on from server to server. He couldn’t give a rats that closing that spreadsheet terminates Excel, he’ll just fire up Excel again to open the next, or that closing that one session terminates the VNC program and he then fires it up again to access the next. Compare that to me where I’ll literally have say 5 or 6 VNC sessions open, spreadsheet, plus plenty of other stuff I’m doing at the same time all open on my screen at the same time (eg no fullscreen, I’m physically looking at and working on more than one task at a time) – I’ll plough through all that work in the time it takes the helpdesk guy to do just one. I’m still achieving what I would in a document centric Mac environment, but behind the scenes its highly inefficient – and when I move on to the next servers I’m then forced to start terminating the multiple applications and fire up more. It’s plain stupid, shouldn’t have to do that. Sure there’s multi-window applications out there for these same tasks, but thereby demonstrating my entire point – applications specifically working around the Windows application centric design. Ultimately it all comes down to a simple question – why is it that a Windows user is so concerned about quitting Word? The fact that anyone is even thinking about starting/terminating applications demonstrates Windows still has a long way to go – one should be concentrating on the task at hand (a letter, an inventory spreadsheet, e-mail messages, etc) not stressing about whether they do or don’t need to be terminating processes from memory and then wasting time firing them all back up again a few minutes later when you need them again. >> Command-Tab switches applications, but not windows. I can’t figure out how to get around the various open windows of an application without using the Window menu, which is cumbersome. Right-click the Dock icon and you’ll see all the windows for that application. Alternatively Expose is a great feature for navigating between any window – I’ve got it set to activate when I scoot my mouse to the bottom left corner of the screen, which then results in every open window being scaled onto the screen at once (still activate and animating) and you then simply click on the one you want to bring it to the front. Very cool – prior to this feature five years ago I likewise found it annoying switching between windows, but Expose is a brilliant approach. >> Differences with navigation around a document, at least how it appears to me so far… maybe someone knows better. Note that to do the Windows style of PAGE UP and PAGE DOWN, where the cursor changes focus not just the document scrolled, COMMAND + UP and COMMAND + DOWN achieve this. Unsure if that’s documented or anything, just something I’ve observed. Ironic that you seem to have obsessed over this quite a lot – I don’t know of any “Windows users” that have even thought about it! The simple fact is that people are comfortable with what they are used to (“we fear change!”). I for one feel like my hands are tied when using a Mac. One mouse button! What am I supposed to do with that?!?!?!?! >> Ironic that you seem to have obsessed over this quite a lot – I don’t know of any “Windows users” that have even thought about it! >> I for one feel like my hands are tied when using a Mac. One mouse button! What am I supposed to do with that?!?!?!?! Steve Jobs is certainly obsessed about that. Mac OSX fully supports right-clicking and scroll wheels though, as do their mice. So although the entire mouse itself is a button and you’re made to think it’s just a simple case of clicking it, the top area is touch sensitive so it knows if you are clicking on only one side and thus registers a right-click. Their latest one just out goes even further – the entire surface is now multi-touch so you can do all sorts of iPhone/iPod style fancies (hoping they bring out a Windows driver soon so I can use it on my PC at work). Alternatively you can just use any old USB mouse just fine. Thanks, but Word isn’t my problem — Apple Mail is. Mail.app is a native Cocoa application so these tricks will affect it as you were desiring.